Online Americans believe that different kinds of data trails have different value and they want control over some of the more personal material. 68% of internet users say it is very important that only they or those they authorize have access to the content of their emails. 62% say it is very important that only they or those they authorize have access to the people they exchange emails with. 55% say it is very important that only they or those they authorize have access to the content of the files they download. 54% say it is very important that only they or those they authorize have access to the place where they are located when they use the internet. 51% say it is very important that only they or those they authorize have access to the content of their online chats or hangouts with others. 44% say it is very important that only they or those they authorize have access to the content of the searches they perform. 40% say it is very important that only they or those they authorize have access to the applications and programs they use. 33% say it is very important that only they or those they authorize have access to the times of day they are online. Clearly, key communications and content are relatively precious to internet users and information about the time of day when they are online is not nearly as important for users to control. 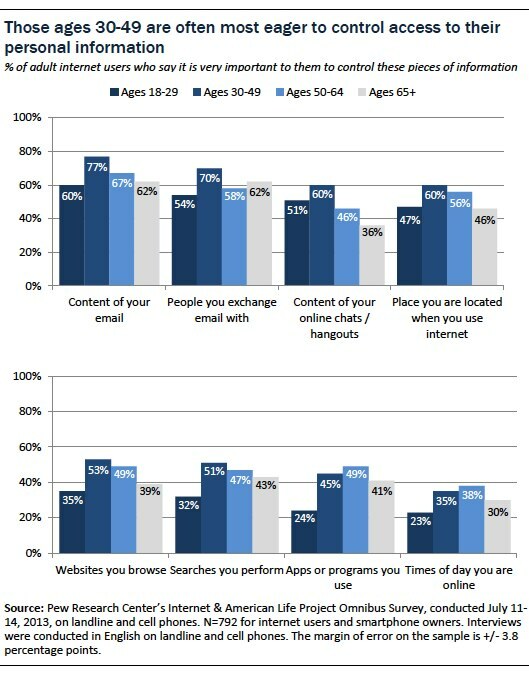 Some of the strongest sentiments about controlling personal information are exhibited by those ages 30-49. Those who are worried about the amount of information available about them online are consistently more likely than others to say it is very important to them that they or those they authorize have access to pieces of personal information. 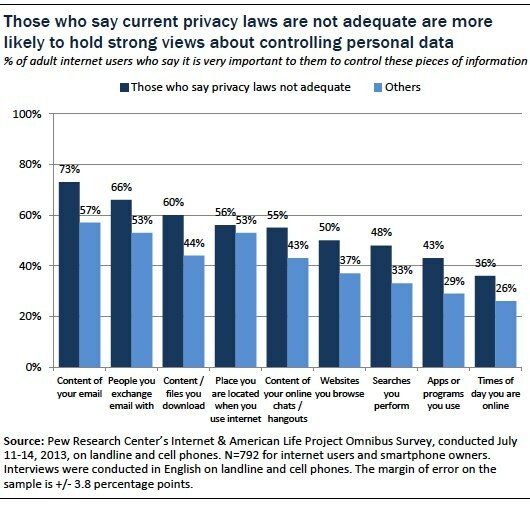 And those who think current laws do not offer enough privacy protection are more likely than others to say it is very important they have this kind of control. There are also some differences on these questions between online women and men. Women who use the internet are more likely than men to say it is very important that only they or those they authorize know who they are emailing (67% vs. 57%). Online women are more likely to say it is very important for them to control access to information about the place where they are located when they go online (60% vs. 49%).